After making Mars Bar Cookies, Evan became quite excited by the thought of “candy cookies”. He wanted to make Twizzler cookies but I had to say “no”…that would have been just plain icky! Thankfully we had a ton of Halloween mini boxes of Smarties so I convinced him to make Smartie Cookies. NOTE – For all the Americans who read my blog – Smarties are like M&Ms they are NOT those sweet/sour chalky candies. Preheat oven to 350 degrees F. Cream together the butter and sugars. Add the vanilla and mix well. Add eggs one at a time mixing well after each addition. Mix together flours, baking soda and salt in a small bowl. Add flour mixture to butter & sugar mixture a bit at a time. Mix well. Fold in Smarties & chocolate chips. 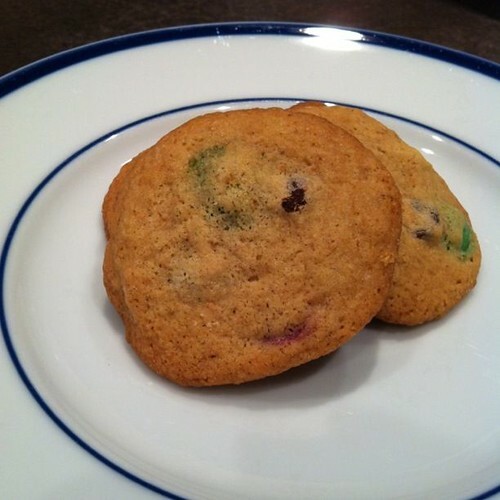 Drop by rounded spoonfuls onto an ungreased cookie sheet. Bake for 9-11 minutes until golden brown. What is your favorite “candy” cookie? I think Reese’s Pieces cookies would be divine. Maybe next time! My favorite candy cookie turned out to be a chocolate chip cookie stuffed with a full Resse’s peanut butter cup. Yum! That sounds AMAZING! I will definitely have to try that…Thanks!